Some of the strangest-looking theropods are the oviraptorids, a very rare group of maniraptorans represented by excellent fossil finds from the Cretaceous period of Mongolia and North America (note that northeastern North America and northwestern Eurasia were connected,as the supercontinent Laurasia, during the Cretaceous period). Some of the most well-preserved specimens of dinosaurs ever found are oviraptorids. Oviraptorids were once considered to be ornithomimid dinosaurs, but are now placed within the clade Maniraptora. The oviraptorid Ingenia on a nest. Photo © Rob Gay. Oviraptorids, including the species Oviraptor philoceratops and Caenagnathus collinsi, are small (about human-sized), with slender limbs, grasping hands, and a bizarre, distinctive skull. 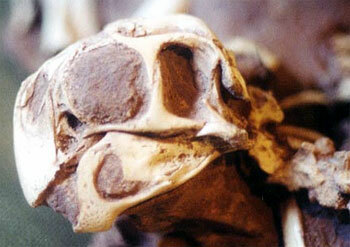 The skull is short and deep, with edentulous (toothless) jaws that were well-muscled and adept at crushing. A prominent crest containing a large nasal cavity was present; the function of this is unknown, but its structure is similar to those in many hadrosaurs, or duck-billed dinosaurs. It may have been an adaptation for producing sound, or for the hot, wind-blown sands of the arid regions that they may have lived in (perhaps implying endothermy), but this is pure speculation. The skull is an example of convergent evolution with some of the ornithopods and also with the dicynodonts, an herbivorous group of early synapsids. Skull of Ingenia. Photo © Rob Gay. The skull gives us some hints about the possible lifestyle of oviraptorids  they were probably not herbivores, but ate mollusks such as clams that lived in the water nearby. The name "oviraptor" (egg snatcher) is a misnomer; their jaws are not useful for eating eggs, but for crushing very hard food. Oviraptorids were originally thought to eat eggs because a skeleton was found near a nest that was presumed to be that of the ubiquitous Protoceratops, a ceratopsian dinosaur. A shocking recent study found an oviraptorid embryo inside one of those eggs, so actually the oviraptorid was by its own nest! More expeditions have found oviraptorid skeletons on top of nests  these devoted parents apparently died in sudden sandstorms while guarding their nests! Just recently, one of the most amazing fossils ever found was announced  an Oviraptor skeleton preserved brooding a clutch of eggs, just like a bird does. The implications are manifold: this find provides excellent evidence of bird-like behavior already present in the close relatives of birds, and hints that these animals may have been endothermic (brooding keeps eggs warm). The jury is still out on that issue though.